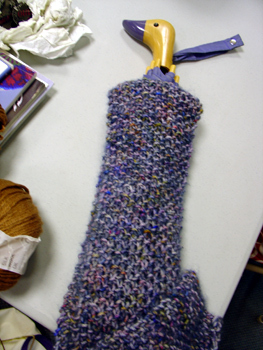 Look, Claire's kidsilk haze scarf matches her umbrella! 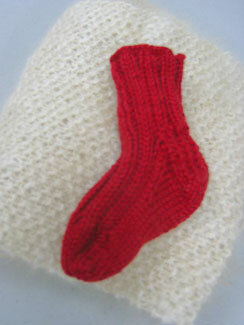 Claire keeps making cutie patootie baby socks. 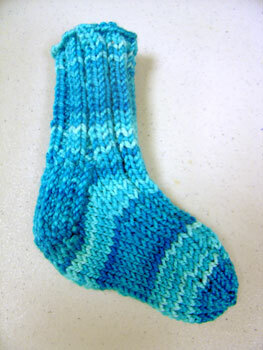 These are in a bright blue from Claudia's Handpainted Yarns. 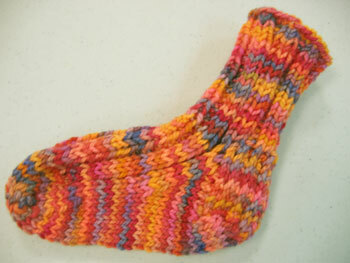 Claire's supercute baby sock in baby cashmerino. There were enough babies around this week for her to check the size too - and it's perfect! 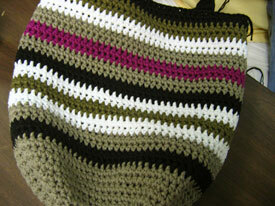 Claire just finished this amazing crochet blankie! So cute. 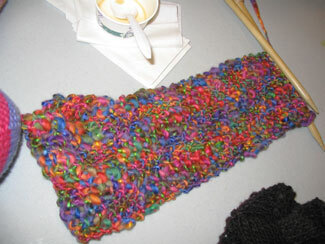 And she's started a chunky scarf in similar bright colors. 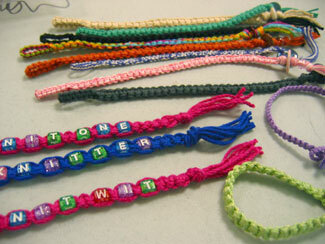 Claire's summer obsession was these knotted and beaded bracelets. 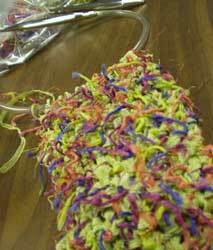 There's nothing she can't do with some yarn and some beads. 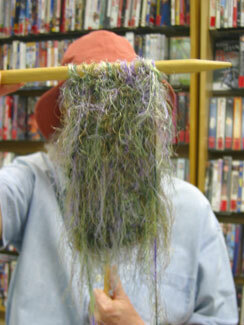 These were inspired by a felted bag that Dani knit. 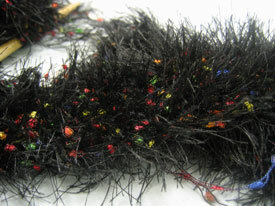 Fuzzy and sparkly? That MUST be Claire! 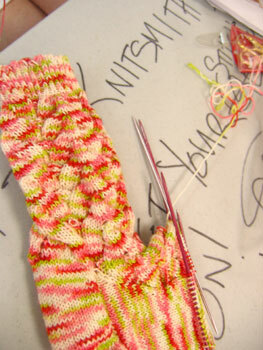 And check out this lovely glittery number she's working on now. 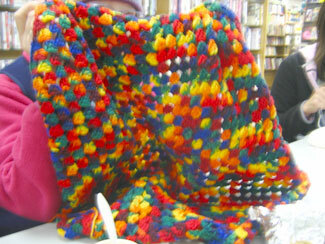 Another of Claire's crocheted pockets and the coolest scarf ever made with self-striping Regia sock yarn. 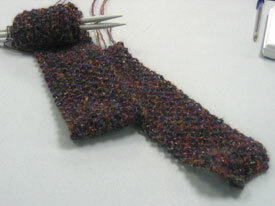 She used two strands of the sock yarn held together - just started at the beginning of each ball - and it totally just striped like that. Awesome! 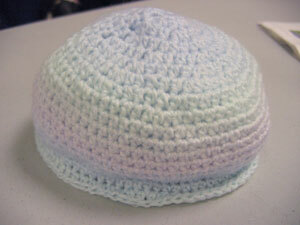 Claire's just finishing this super sweet Sirdar baby hat. Still to come: her trademark squiggles on top! 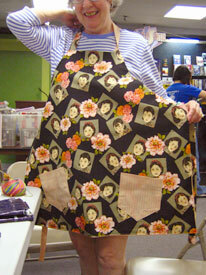 Last week, Claire got some fun vintage geisha fabric from Dava and this week she brought in an already finished apron she made with it! 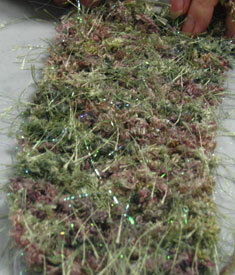 Here's her latest scarf made with new sparkly yarn she found on a recent trip to Webs. 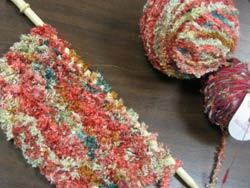 Lucky for Claire, it seems like all the new yarns this fall have some sort of glitter in them. 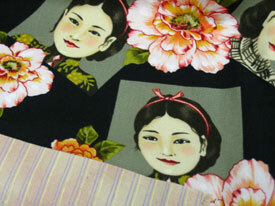 The last few weeks, she's been working on new, beautiful striped bags in Saucy cotton. Look at those great colors! 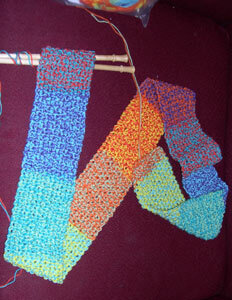 Claire's working on another fun Squiggle scarf! And more pink too. We can always count on Claire's bright knits to cheer up our Sundays. 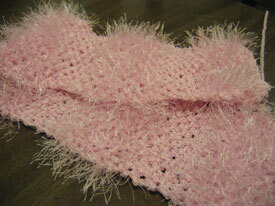 Claire's beautiful, pink, fluffy scarf. 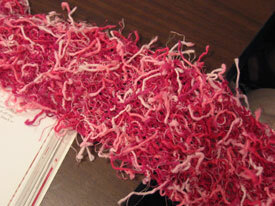 It's the perfect pink of the breast cancer awareness logo and oh so soft. 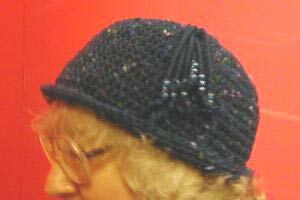 Claire loves to crochet cute little pockets for holding eyeglasses and coins and whatnot. She brought these in this week. 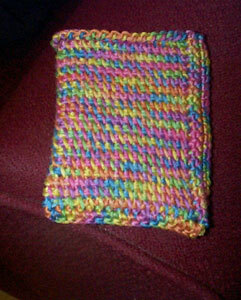 Can you say "iPod cozy"? 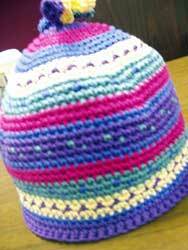 Claire always picks the neatest yarns for her crocheted hats and bags. 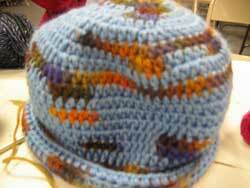 This hat is being done in Print 127 which combines solid and variegated sections and looks great crocheted! Scarf season approacheth! Claire knows it's time to get out the Isis, Eros, and Charm yarns and let the fun begin. 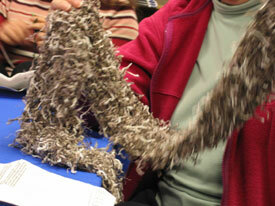 Look at Claire's incredible crocheted shawl! 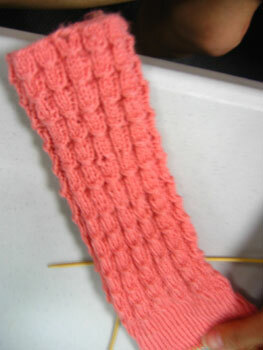 I love the stitch pattern. I've got to get Claire to write this one down for me! Momma's got a brand new hat! Claire's doing fair-isle crochet now. Too cool! 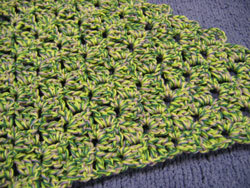 Claire's traded in her crochet hook for some US11 knitting needles in order to make this neat scarf in a new yarn called Squiggle. 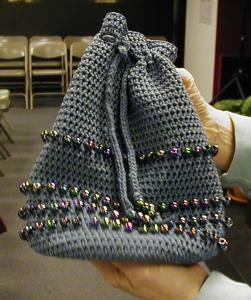 Claire, the queen of crochet, has made a few more of her beaded bags. 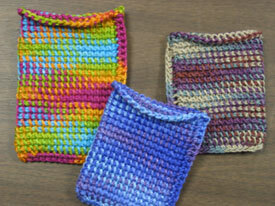 These are made with Berroco's new Suede yarn. Claire's stuck on Kureyon these days! 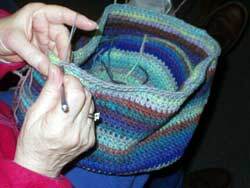 Now she's working on a crocheted bag alternating two different colorways of Kureyon. What beautiful colors. 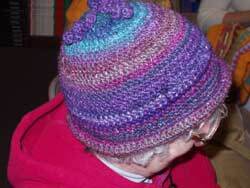 Claire's just finished crocheting this fun hat out of Noro Kureyon. She even added some fun squiggles on the top! 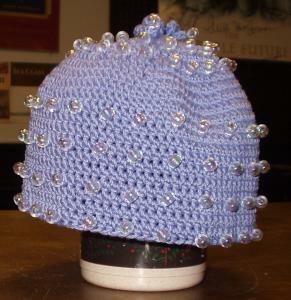 And now little beaded hats in the cutest colors. 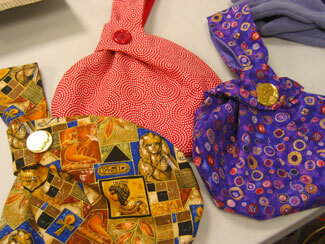 And here's one of her bags. 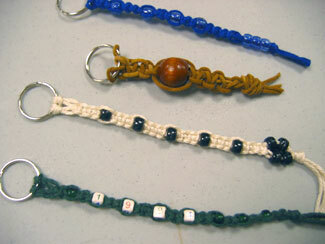 Claire loves adding beads and fun tassles to her stuff. 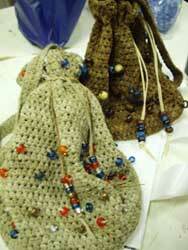 (Crochet) Claire is our crochet expert and has made some unbelievably wonderful purses, which we all want to buy. 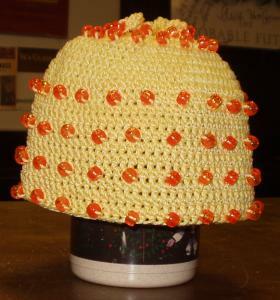 Here she is modeling a hat that she recently finished. Look at the cute tassel on top!